Answer 10 trivia questions correctly. Answer 20 trivia questions correctly. Answer 3 trivia questions correctly. Destroy all of the fuel in the fuel depot. Finish a level without killing any enemies. Finish any level in less than 20 seconds. Kill 20 or more enemies on any level. Complete a level without setting off any alarms. 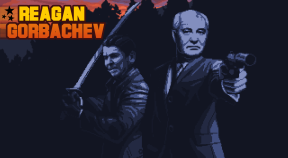 Defeat 25 enemies with Reagan's katana. Defeat 25 enemies with Gorbachev's blowgun. Defeat 25 enemies with the hand gun. Defeat 25 enemies with the silencer pistol. Defeat 25 enemies with the shotgun. Defeat 25 enemies with the bazooka. Defeat 25 enemies with the grenade launcher. Defeat 25 enemies with the Uzi. Defeat 25 enemies with the minigun. Defeat 25 enemies with the assault rifle.